Pablo Escobar is one of the most infamous Drug Lords in history. His cartel used brutal, violent tactics to make their way to the top. Pablo Escobar was also loved by the people of Medellin where his cartel was based. Why? Because Escobar knew that in order for his cartel to be successful he needed to be well liked. He poured wealth into the city. He funded a soccer team and many other projects that helped the civilians living in the city. This created a reliance between the people and the cartel. More importantly it created a disconnect between the civilians and the government. Today, Joaquín “El Chapo” Guzmán uses similar tactics to raise civilian support for him and his Sinaloa Cartel. Guzmán reportedly provided work to farmers, sent aid to the elderly, and gave toys to children. So, it made sense when he was arrested in 2014 that many people took to the streets in Sinaloa in support of “El Chapo”. 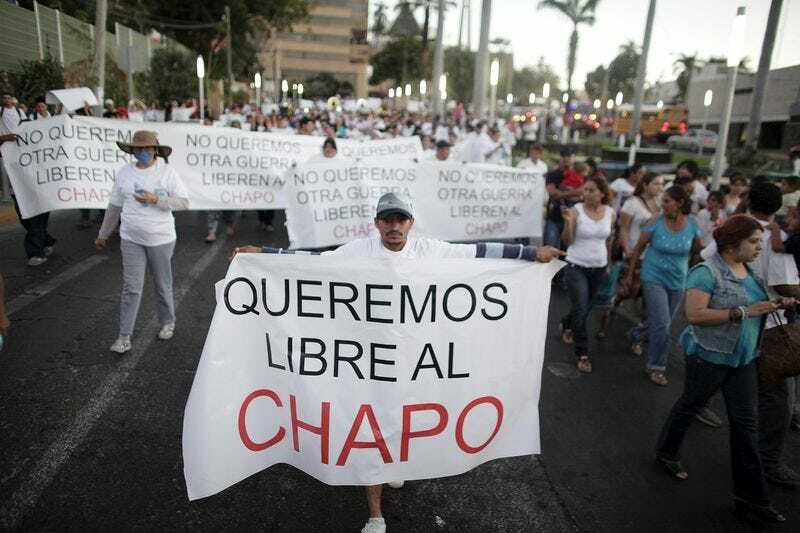 One sign read, “El Chapo is the defender and protector of the people, we demand his liberation.” Unfortunately this happens because the people in Mexico don’t know who to trust. The police force is incredibly corrupt and the Cartels are violent. Another sign that the Cartels are meticulously crafting an image is the 5:45 rule. A safety tip in Ciudad Juarez is to simply stay inside at around 5:45 PM. Why? Because this is when the Cartels try to murder people, because it will be the leading story on the 6 PM news. The Cartels aren’t shy they want their killings to be in the headlines. The Cartels use these killings to send a message that they aren’t to be messed with or it will be met with death. They also kill strategically in other Cartels territories to draw military attention to the area. It is absolutely terrifying to see the Mexican Drug Cartels employing the use of a pseudo “Corporate Social Responsibility”. I say pseudo because clearly the Cartels don’t actually care about the people, they just want the people to not tell on them. The combination of their CSR tactics and brute violence has been effective. The public support of Guzmán within the Sinaloa region is proof of this.